Just west of the Arkansas River in the middle of Wichita, Kansas, you’ll find a neighborhood called Delano. It was once a standalone town at the end of the crazy-cowboy Chisholm Trail, a point dusty cattlemen knew for its saloons, brothels, the occasional gunfight, and a hard-earned bath in the river. A few years passed, and the area was a seat of the nascent aviation industry, where the likes of Walter Beech and Clyde Cessna built some of the world’s first airplanes. Today, you’ll find there, among other welcoming outposts, a brewery called Aero Plains Brewing, where the bar (the one you park your elbows on) is made from the wing of a Beech Model 18. The brewery sits on Wichita’s crossroads of saga and innovation, where the historic greets the runways of the self-declared Air Capital of the World, and the beers get named for cowboys and aviator-type characters. It’s the history of American expansion, celebrated with a toast. On my first day in Wichita, it was at Aero Plains that I met music buff Jedd Beaudoin, who teaches art history at Wichita State University and hosts KMUW’s music show Strange Currency. After a couple of brews, Jedd kidnapped me and we beelined it for the city’s annual Vortex Music Festival, where Dwight Yoakam headlined and Canadian singer Lindi Ortega stole the show. The festival hummed with great bands, beer, local food, lawn games, and a midnight movie under the stars. By the end of that first night, I had a posse of new Wichitan pals that framed a perfect week-long escape. This sort of easygoing, libertine episode upended my notion of Kansas as a bedrock conservative bastion of temperance. A rough-and-tumble river town in the 1870s, the city endured a Prohibition that Kansas dragged out till 1948 -- America’s longest, most uptight crackdown on the drink. The biggest city in Kansas at more than 400,000 people, Wichita still doesn’t exactly cry out “spend a weekend here.” Out-of-towners are probably more apt to visit nearby Tulsa, Kansas City, Branson, or even Bentonville. The result is a town that feels only like itself. When you’re in Wichita, you’re really in Wichita. And because it’s still so underappreciated, the locals will be ecstatic you made the trip. I visited this unheralded patch of middle America with Wake and Wander’s Will McGough, who’s also no stranger to big-city dwelling. At some point we concurred that most braggy urbanites don’t actually take advantage of their theaters and museums, the worldliness at their feet -- ask most New Yorkers about their last trip to the opera and watch them squint back at you. In our respective cities, we decided, one live music venue, two bars, three neighborhood changeups, four restaurants, and five friends pretty much does the trick. Translation: Wichita has more than enough to get a kick out of a weekend trip. The vibe here starts with a beer revolution that truly brings locals and visitors together. 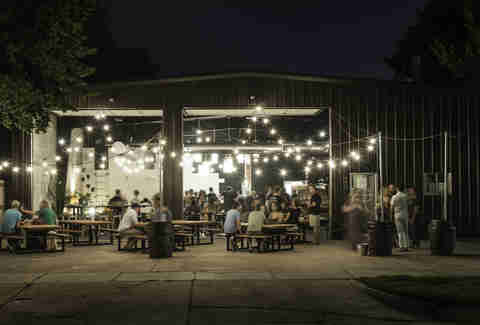 The city’s surging beer garden culture revisits pre-Prohibition USA, when every hamlet had beer-making public houses. Old Town now has 100-plus thriving businesses on brick-lined streets showcasing an anthology of mid-1800s converted warehouses, antique lamp posts, Coleman’s founding factory, and swank condos. You can feel history shaking hands with an overflow of happy hours. Historic Delano, Wichita’s once notorious sin city on the Arkansas River, was known for booze-fueled brawls, busy hookers, gnarly gamblers, and overflowing saloons with cattle-driving cowboys prone to gunfighting (even though Wichita was a “check your guns at the door” city, even in those days). Today, you’re more likely to overindulge at a bakery or a brewery. 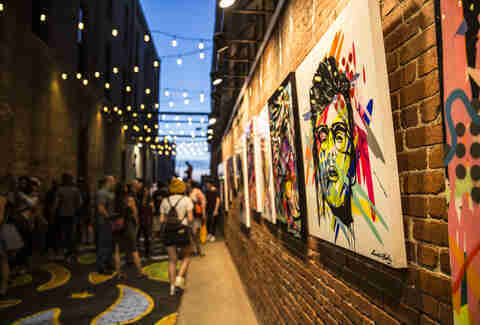 Downtown is a hub for humble-hipster expression and gathering spots like Gallery Alley and the Pop-Up Urban Park with rotating food trucks, such as Funky Monkey Munchies’ crab Rangoon tacos. The Douglas Design District has fun hangouts like Donut Whole, a trendy-but-earthy donut shop and coffeehouse. The area is also erupting with murals representing the likes of Wichita’s cowboy and aviation history and forward-leaning “love where you live” messages. Wichita’s wide sidewalks mean you’ll get to wander around here without being punished like a pinball. On the last Friday of every month, Wichita celebrates art and culture with Final Friday. Galleries, studios, museums, restaurants and retail shops around Wichita stay open late and welcome locals and visitors to celebrate art with special showings and receptions of local artists -- all free to the public. 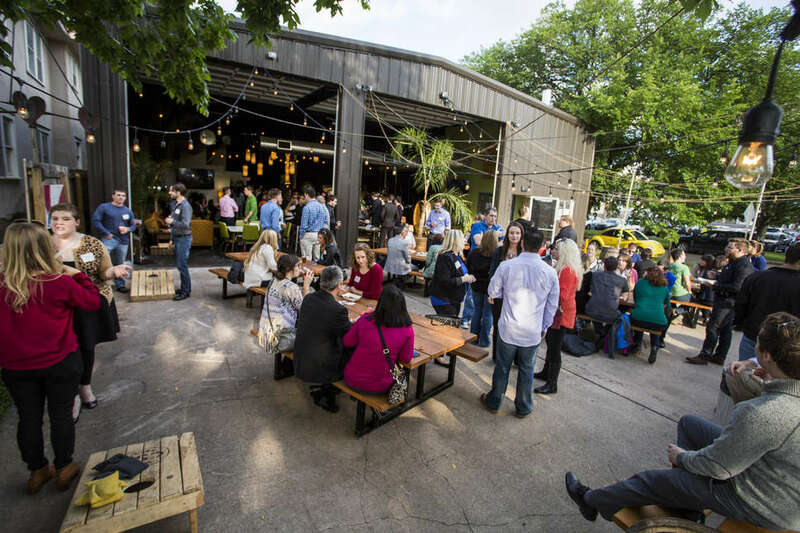 During Wichita’s warmer months, you’ll find Botanica Wichita packed with people every Tuesday night to rock Tuesdays on the Terrace, mid-week shenanigans (live music, booze) at the city’s botanical gardens. Live music fans are always in luck here, as you’ll find musicians serenading patios across the city every night. Not just that honky-tonk stuff either. Well, you’ll find that too, and Wichitans are OK with that. Another annual festival, Autumn & Art, means sipping wine or beer as you stroll through the open-air gallery and enjoy (you got it) more live music and entertainment. Year-round, things stay popping with Midwest Beerfest, Automobilia Car Show & Street Party, and Bloktoberfest, a blowout mid-October beer bash. My drinking resume includes kava in Fiji, glacier-iced cocktails in Antarctica, magic-mushroom shakes in Laos, ayahuasca in Peru, homemade rum in Martinique, 120-Minute IPAs with the founder of Dogfish Head, hallucinogen-inspired coffee in Ethiopia, lionized Scotch whisky in the castle/home built by the dude who invented Glenlivet, not sure what in India, and homegrown Long Island wine. So take it from me when I say Wichita is one hell of a place to enjoy a sip of alcohol. Wichita drinks like a town that’s making up for lost time. Nearby, Wyldewood Cellars and Grace Hill Winery show-and-tell how America’s prairie does wineries. Need the hard stuff? Wheat State Distilling, in Old Town, is the area’s first (legal) distillery, turning out a variety of liquors that rely on local Kansas grain. Of which there are many, as you might imagine. Speaking of grains: Craft breweries are surging here, serving $4 pints on patios and upending the social landscape. You’re always a stone’s throw away from at least one of nine brewpubs, six of which are newbies. 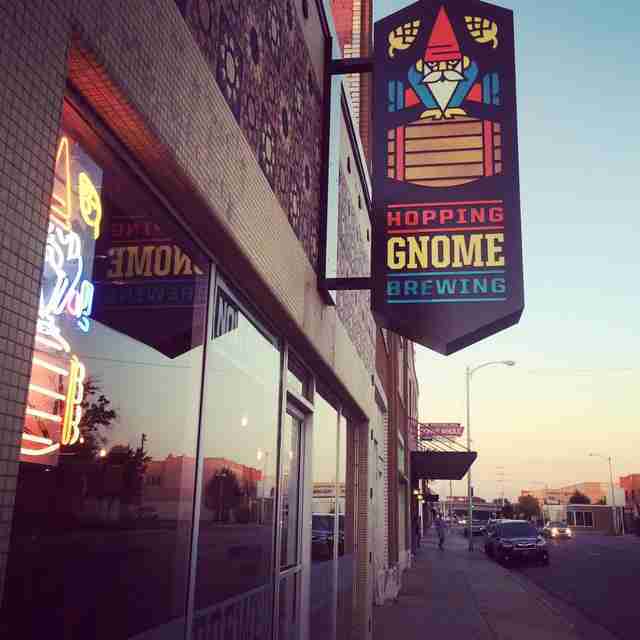 The gnome-themed Hopping Gnome was the city’s first taproom, and it opened just six years ago and uses as many ingredients as possible from Wichita. The unassuming Limestone Beer Co. serves up German- and Belgian-style brews. River City Brewing Co. has two roomy levels, both with wrap-around porches overlooking Old Town. Third Place Brewing sometimes closes the street behind their location so they can have outdoor parties/beer gardens: They did this last year for their anniversary and plan to do it again soon for March Madness. Wichita Brewing Co. & Pizzeria has two locations, both offering earth-rattling IPAs and wood-fired pizzas of the month. The diversity of excellent food will likewise surprise you, largely because the middle of America has a stronger immigrant presence than you might assume. Some 10,000 Lebanese people have migrated here over time; ditto the Vietnamese, who, since 1975, have fed this culinary melting pot. And Piatto Neapolitan Pizzeria, which rides on 300 years of tradition and technique, sports a 3-ton brick pizza oven that was built in Italy. This is a festival town. The newer big outdoor music festivals is the aforementioned Vortex, which gives revelers a chance to rock out to progressive-Americana genres like alt-country and thrashgrass, all while camping out in the city. The granddaddy, though, is Riverfest -- a nine-day musical kaleidoscope that drew more than 400,000 people in 2017 -- including concerts and performances on three stages featuring 40 artists, parades, a fried-food paradise, a hot air balloon launch and kayaking or jet skiing on the Arkansas River. The 15 years-strong Tallgrass Film Festival attracts 16,000 attendees to Wichita’s downtown for five days of richly diverse movies (before they go mainstream). You can attend back-to-back parties complete with writers, directors, filmmakers, and performers, in close, chill digs where you actually get to hang out with them. Keynote speaker Bruce Northam is the author of The Directions to Happiness, a 135-country quest for life lessons. Think of it as a Chicken Soup for the traveler -- with balls. Track him on AmericanDetour.com.